Before getting in to what happened to the Montecito Wine Bistro, let’s be clear: This could have happened to anyone, and that’s why it’s worth talking about how fast scheduled tweets and Facebook posts can become a social media nightmare. By all accounts, the California restaurant has a stellar history, with favorable reviews and impeccable credentials in fine dining. The lineage goes back to 1962 and Pierre LaFond, founder of one of the Santa Barbara-Ventura area’s first vineyards, the restaurant and a high-end specialty grocery store. Montecito Wine Bistro embraces the farm-to-table concept with fresh, locally sourced foods and exceptionally well prepared cuisine. It’s elegant but comfortable, with an outdoor patio on a street just a bit more than a mile from the beach, and it’s even kid-friendly. Of course it was inspired by the holiday season. Of course it was well-intended and welcoming. Of course Montecito residents, and the wider Twitter universe, were stunned at how tone-deaf the message seemed in juxtaposition with the catastrophic Thomas Fire that’s left their homes and communities in ashes. “Shameful, distasteful – if your home had been lost would you have posted this? I think not,” said one response. “As a resident of Montecito, I don’t appreciate you mocking my personal safety & our friends and family who have suffered. There’s a difference between funny and callous,” said another. Then there were the people who asked the obvious question: Did Montecito Wine Bistro need a new social media manager? “If you are in need of a new social media/marketing person (which hopefully you now are), I’m available for hire and actually live here and know what’s going on in the community,” said another. It took some four hours, but eventually the Twitter message was gone. Not so the upset. Professionals understand pretty quickly that this was a scheduled Tweet that went very very wrong, but the public doesn’t always see that. The situation is made worse when the agency or community manager hired by a business doesn’t live in the area – or even the country – and has no idea their work is now offensive. Scheduling Facebook posts and Twitter messages is a useful tool that keeps countless social media managers and small business owners sane. Yet it’s important to remember that, even if that scheduling is convenient and well-planned, you can’t walk away and just forget about it in real time. 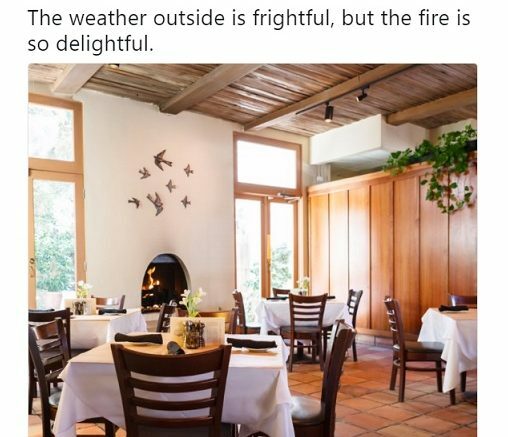 The Montecito Wine Bistro, by all appearances, is a top-notch business owned and operated by people invested in their beautiful community, and hopefully that community will extend a little grace at this difficult time. Mistakes happen, lessons are learned – but they can be expensive, and there’s a lesson here for a lot of other businesses too.